Where productivity is imperative, the call “Turn off the air-conditioner!” is certainly an unnecessary distraction. But employee welfare isn’t the only important factor governing the everyday life of a typical office building: energy consumption – whether mechanical or human – in unused spaces and systems, is a key consideration for organizations incessantly seeking ways to achieve organizational efficiency and cost savings. Nowadays, managers, engineers and architects alike face the need to make organizations more efficient. Naturally, there exist different approaches to this issue. One interesting take involves seeing efficiency as part of a larger set of issues – sustainability and employee comfort. Marrying these considerations and undertaking a holistic approach, Mochly-Eldar Architects is designing a first-of-its-kind office building in Israel for a leading semiconductor company. This building uses IoT – the Internet of Things – to improve employee welfare; streamline the organization’s work; and design the greenest building in Israel. We deemed it worthy to write this article and probe the design considerations for the office buildings of the future. During the past few decades a huge leap has taken place both in green architecture and in developing solutions for inhabitant comfort: the “Smart Building.” It is able not only to automatically dim the lights, but also neutralize unnecessary distractions, accommodate employee preferences, and improve efficiency. 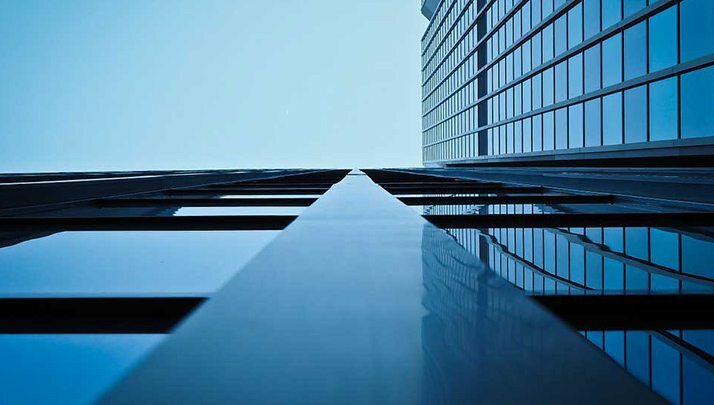 The IoT system, which provides employees with access to the building through an interface synced with employee timetables and work environment preferences, provides the building with the information required for optimal system management. The Office of the Future provides an overview of recent trends in “smart” office design. 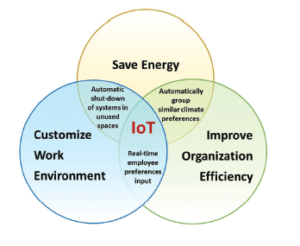 The article discusses the advent of Internet of Things – IoT for short – and its use to improve office design, performance and culture. The article also discusses the ramifications of using IoT in light of privacy and security considerations. We are delighted to take part in tapping into the architectural possibilities of IoT and promoting this technology in Israel. The human-building interaction turns into a major energy efficiency opportunity on the one hand, and HR economy on the other; where energy economy, organization efficiency and personal work environment customization overlap, one can kill three birds with one stone. Based on user-gathered information, the system regulates the climate in entire sections of the building, and even seats together employees with similar preferences. Where almost 30% of energy usage is for cooling/heating unused spaces, rethinking ways to read the pulse is key. Suppose that on a certain day approximately 40% of employees are out of the office, while others man their stations. In a typical building, the lighting and air-conditioning systems continue to work normally, and cleaning personnel empty all trash cans. By contrast, in a smart building, the system receives feedback from the calendars of out-of-office employees, so the electric points in their stations automatically shut off. Maintenance managers, furthermore, can brief the cleaning personnel that only 60% of stations need attending to. From a climate perspective, such system can join forces with existing green technologies, such as shading and natural ventilation. To automatically adjust the shading angle for each workstation, shading algorithms combine climatic data with the employee’s lighting preferences – to get the perfect louvre angle. In addition, opening the building envelope to fresh air reduces recycled air side-effects (e.g. headaches and dizziness), as well as moisture buildup. The opportunities of a unified strategy are endless, but what are the potential challenges it poses? First, privacy: employers know their employees’ locations at any point in time; thus, IoT would undoubtedly require formulating internal regulations – perhaps even legislation – to maintain boss-worker balance. Furthermore, organizations must secure the system with extreme care lest sensitive information leaks out. Although certain features might pose ethical and logistical problems for the “Smart Building” and IoT, one must remember that the various building elements are not necessarily interdependent; each parameter has its own level of autonomy. For example, to overcome the privacy issue, the feature of dynamic station arrangement via employees’ smartphones can be eliminated. Since this technology is evolving and developing, it is natural that there are several challenges to be overcome – but the potential for sustainability, human or mechanical, certainly justifies the effort. 1. Seth Porges, “Your Air-Conditioned Office Could Be Hurting Your Productivity—Here’s How to Fight Back.” Bloomberg.com, 23 August, 2016. 2. Eric Brown, “Who Needs the Internet of Things,” Linux.com. Published Sep 13, 2016. 3. Tom Randall, “The Smartest Building in the World.” Bloomberg.com. Published Sep 23, 2015.